The ornithological jury is still out about the fate of the Ivory-billed Woodpecker (sometimes called the “Lord God Bird,” allegedly because its beautiful appearance provokes this exclamation from first-time viewers). Is it extinct or on the brink of extinction, if recent “sightings” are credible? 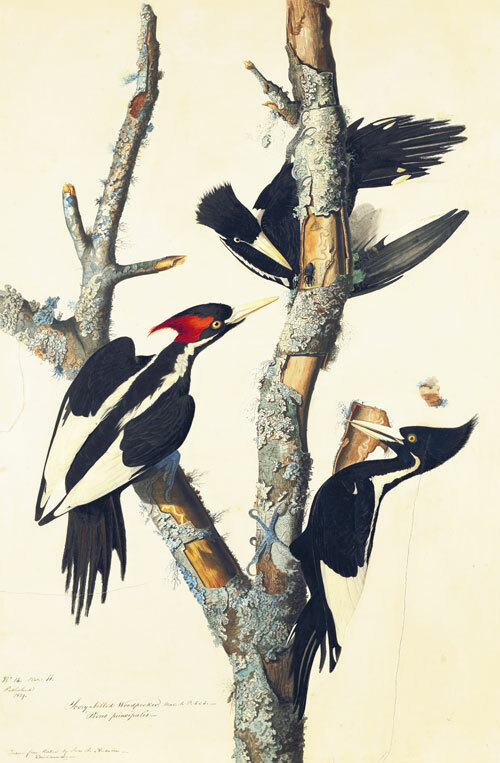 In Audubon’s era, these woodpeckers were harvested for their beauty, and JJA notes that Native American chiefs wore belts ornamented with the tufts and bills of the species, which were highly valued. Today most of their habitat, in dark swamps with gigantic cypresses, has been destroyed, leaving them without refuge. It is probable that their characteristic haunting cry—pait, pait, pait—has been silenced forever. Other than in old photographs and film footage from the 1930s, the Ivory-billed Woodpecker lives only in Audubon’s superb vignette. Since 2005 there have been a number of credible sightings in four locations in the south by various individuals who also noted or recorded its “kent” calls. Among them are those made in 2008 in the Pearl River Basin of Louisiana, where the bird flushed several times, allowing distant video footage and sound recordings. A putative double knock, which is characteristic of the Ivory-billed Woodpecker, was captured in another video a little over a minute before a large bird with characteristics consistent with an Ivory-billed Woodpecker flew into view in the Santee River region of South Carolina. Perhaps the most optimistic statement one could make about the status of the species would be that some individuals may still remain, but the long-term future of the Ivory-billed Woodpecker is uncertain at best.